Newly remodeled and under new management! Come experience the magic of sayulita from the most spectacular Villa in the downtown area! Beautifully remodeled for the 2016-2017 season and under new management, we are ready to provide your group with an exceptional vacation experience!! Our full staff will take care of you from start to finish. We can provide and set up all services you may need or desire, such as: Personal chef, massage, surf lessons, catamaran trips, fishing guides, restaurant reservations and recommendations. We can also arrange for airport transfer, car or golf cart rentals and excursions out of town. Mi Orta Casa is open air and beautifully decorated in a sophisticated Mexican style. Our fully equipped kitchen is ready with everything necessary to entertain/cook for a large group! Our open air dining area comfortably seats up to 10 people, with a bar for 4 connected to the kitchen. 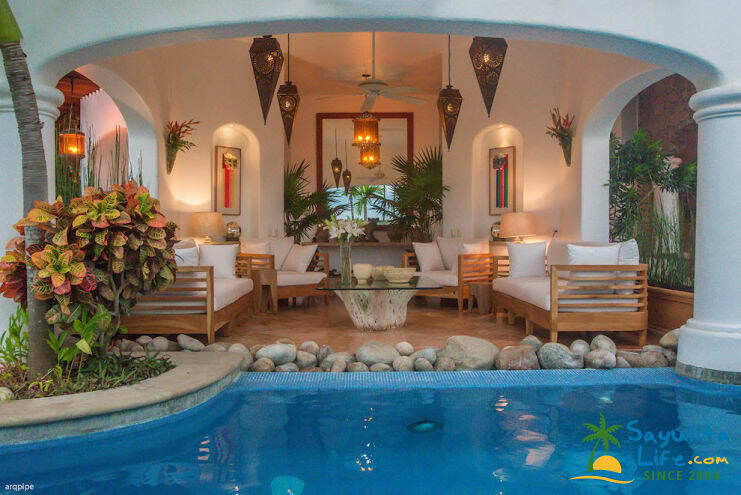 Beyond the kitchen you will encounter a large indoor/outdoor living area that overlooks the refreshing infinity pool with a lovely waterfall and a palapa area with in-pool bar stools, Sayulita´s climate along with our pool area is ideal for lounging in the sun, or relaxing in the shade. The main floor of the villa contains the living room, kitchen, dining area as well as the pool. Continuing to the back of the property you will find a quiet terrace area with 3 bedrooms. Luna Room: For one couple, with a queen size bed, desk, closet, private bathroom and is air-conditioned. Arena Room: Has twin beds, desk, and closet, private bathroom and is air-conditioned. Sayulita Room: Our master bedroom on this level, with a king size bed, covered terrace with a palapa and an incredible ocean view. Air-conditioned, private bathroom with double sinks, kitchenette, TV room with a sofa that converts to a single bed. Flores Room: Our largest room with amazing private terrace with a round table overlooking the sea. The bedroom has two-queen beds ideal for 2-4 people, a living room with 2 sofa beds, private bathroom and is air-conditioned. Agua Room: A special room with a lovely private terrace overlooking the sea, king size bed, private bathroom and Jacuzzi with ocean view. The Agua room also has a TV room and 2 convertible single beds and AC. Palapa Room: Our only bedroom on the third floor nestled under a large palapa. It has a king size bed, private bathroom and a semi open living room with 2 convertible sofasand a private with a balcony overlooking the ocean. MOC may rent 5, 6 or 7 bedrooms please see the rate section for details. Gorgeous bedrooms with private bathrooms and a LOVELY roof-top ocean-view deck! We had an awesome time here with 10 people. There were 7 bedrooms and 5 were AMAZING master bedrooms with private bathrooms. It was classy, in wonderful shape and VERY close to the beach, shops and restaurants. It is an ideal location for action-loving and festivity-seeking groups! Superior accommodations and amazing service provided by the staff! The house was perfect for our company retreat. Enough space that we could move around the house and enjoy all the amazing views, while still having enough space for all 10 of us to sit and get some work done as well. Pool was great; location was perfect; view...outstanding. Would highly recommend this rental to anyone going to Sayulita. House staff was accommodating and super helpful with everything we needed, including airport transfers. Thank you Mi Otra Casa! We had our company retreat at MOC last week, and it was perfect for our group of 10 people. Jose Luis is a great house manager and will take good care of you! There are also options for hiring a chef to cook at the house if that's something you're interested in. 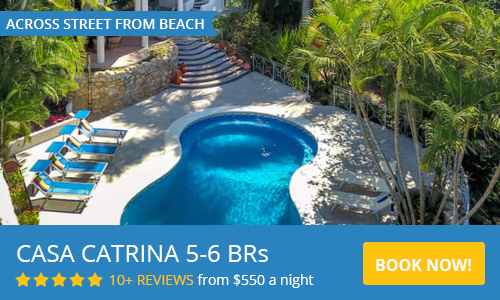 The house is a two-minute walk to downtown Sayulita, and exploring the southern and northern areas of Sayulita is a nice 10-15 minute walk from the house. The pool and roof are beautiful and very well maintained by the house staff. Enjoy! Our experience with Mi Orta Casa was mixed.....Working with Julie to set up the rental was great. She was always quick to respond and very helpful. The house mgr., Jose, could not have been better. He was not only a very nice person, but he also always easy to get ahold of, checked on us every day and had great suggestions on things to do. He set up an amazing chef for our breakfasts and a couple of dinners. Julie and Jose seemed to really want to make sure we had a good time. The house was nicely done and very clean. One of the reviews mentioned that the ground floor rooms weren't equal to the ones upstairs. I guess that was true, but could be easily fixed with adjusting what people pay per room. No one seemed to care in our group. I think a couple of issues we had are that it's a very vertical house and the floor plan is pretty choppy. The best place to hang out is the roof top, but it's far from the kitchen and pool(which are on the ground floor). So we mostly squeezed into the small living room off of the kitchen and pool. However, the roof top is very nice and the view is great. The pool is also nice, but there isn't really any place to hang out by it. You can swim up to the small living room and talk to people sitting on the sofas which is fun, but the pool isn't great to sunbathing. Keep in mind that if you can't do stairs well this isn't the house for you. The only other issue was the noise factor. Julie did tell me about the noise, and suggested ear plugs--which I really appreciated. We were a group of 13-14 and we tend to be a bit loud. So we didn't worry about the noise issue when Julie mentioned it; however, I don't think we realized what it meant to be above the plaza and bars... It's a fun location to be so close to everything, but the noise doesn't really stop much. There was a time that we couldn't play a game on the roof top because we couldn't hear each other. The bands in the bars start to warm up around 5pm and by 9ish they are rolling until about 3ish. The mornings are better. Also, I should note that we were there during the holidays, so my guess it is even a bit louder than normal, but based on the other reviews I do think it is normally pretty loud. I think it's important to remember every place has it's pro and cons. You just need to decide what you want. 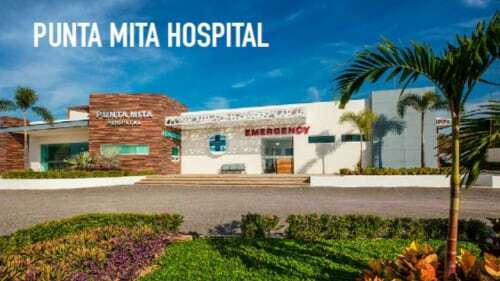 Regarding Mi Orta Casa....if you want to be well taken care of, in a beautiful home and in the middle of everything this is the place for you. If you want more peace and quiet and don't mind walking/driving into town then Mi Orta Casa isn't for you. We have been traveling a lot around Mexico, searching for luxury spots. But then we found out this special pueblo Sayulita and decided to discover it. Mi Otra Casa is the perfect match for this place, a big, cool villa, with a great location, close to the main plaza and 2/3 minutes walking to the beach. The welcome by Jose Luiz was amazing, he knows everything and great secrets of Sayulita, so made our stay even better. The service was great, we had a SUPER stay. This was our second time to Sayulita. Our experience the first time was completely different than this trip that we had in March of 2016 at Mi Otra Casa. It is extremely loud in the evening with the restaurants and bars and then its very noisy in the morning with the hustle and bustle of the town. They have cars that cruise around with loud speakers selling different items each day. The owner told us the other reviewers were much older and not party people and that it was not that noisy. He was incorrect and just wanted to rent the place to us. We are all fun people who liked to enjoy the bars and fun...but, we also like to sleep when we get back to the house. Also, if you are traveling with a group...not all the rooms are of equal quality and fittings. So you will need to make allowances for those who are on the first level. 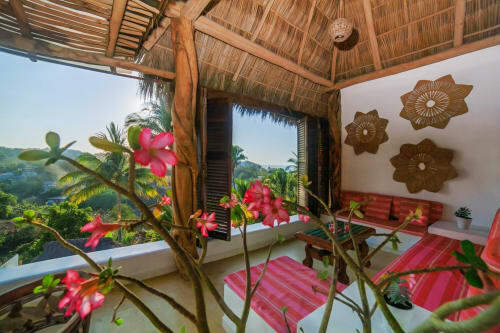 The second level rooms are nice and the palapa area also. The palapa area is open, and I don't believe it has ac. The pool also looks bigger in the photos...fyi. I would recommend getting another place further from the city. We are so sorry you did not enjoy your stay at Mi Otra Casa. Our goal is to always have everyone leave happy. We are however a Villa that overlooks the plaza in the downtown area and Sayulita is a lively and busy Pueblo so noise in that area can be expected. The rooms are all described in detail as well as on video on our website for you to see, again I'm sorry that was a disappointment to you. There are many beautiful rentals in Sayulita and we sincerely hope on your next visit you will find one one that is a better fit for your group. Beautiful House, Amazing Location, Professional staff! I had the pleasure of staying at Mi Otra Casa for my 5 year wedding anniversary with 16 people. From the very start, dealing with Edgar was a pleasure, he was incredibly responsive and very helpful. Then upon arriving at the house, it was BEAUTIFUL, and the staff was amazing. The house manager, Waipy, checked on us daily to make sure we had everything we needed, and Ivan our bartender could not have been nicer. We had them arrange daily breakfast in the house which was delicious and definitely recommended! The view from the upstairs terrace is breathtaking. Overall it was an amazing experience. One caution, it is right in the middle of town and can stay noisy late into the night, but I had read that in several review, so we knew to expect it. I would definitely stay here again if I were with a large group. What a great vacation spot! My friends and I were in Sayulita for a wedding and the Mi Otra Casa served as the perfect nesting place for 17 of the wedding goers. The views are spectacular, the pool is warm & inviting and the rooms were perfect! We are a lively bunch and really enjoyed being close to the town square. Just a quick walk to a taco stand, cold drink, shopping and the beach. The noise at night wasn't bad as we were up late as well. The 3rd floor living room was the perfect place to watch the sunset and listen to the music from the square. Oscar and his team were great and very helpful! Oscar helped to arrange breakfast and dinner to be made in the house. Everything in the kitchen worked fine. The pool lights didn't always work but it wasn't a big deal. I can't wait to come back to Sayulita and I only hope that we come back with a large group in order to enjoy Mi Otra Casa once again! Oscar and the crew at the house arranged everything for us including pick up at the airport and the best Huevos Rancheros in the mornings to get us up and out for surfing and adventures! A few blocks from the beach with awesome views. The town square is close and the bars are right there - great location for lovers of live music and great food! Damage deposit of $ $1500 USD due upon your arrival and returned at your departure. Rental of the entire villa only. No individual room rentals. Sol, Flores, Agua and Palapa suites permit additional guests for $30/nt per guest. Daily maid service is limited to room/house cleaning. Additional services including laundry & the preparation of meals is available upon request. 50% deposit upon booking, balance due on arrival. Based on the calendar, it looks like some of your requested dates are already booked. Please makesure to check the calendars before emailing owners. Rental and/or owner has been physically verified by a SayulitaLife.com staff member.